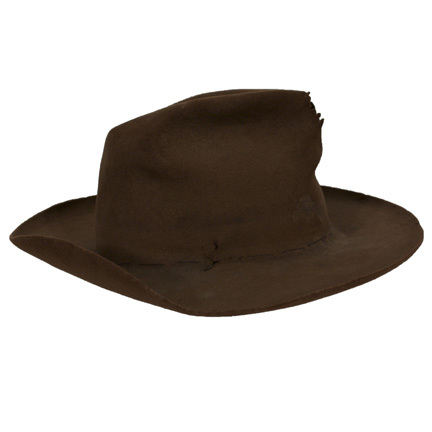 This cowboy hat was worn by the character “Rooster Cogburn” portrayed by actor Jeff Bridges in the Coen Brothers remake of the classic 1969 John Wayne film “True Grit”. 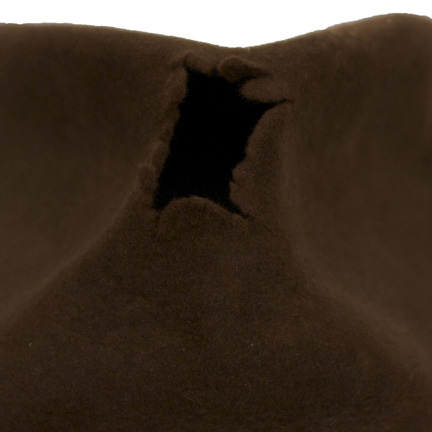 The vintage hat is constructed out of a brown beaver felt and has evidence of sweat, dirt, and debris that has been deposited from years of use on productions. These stains and debris can be screen matched in almost every frame suggesting that this was the one and only hat utilized during production. The hole at the front of the crown was added by the film’s costumers to help create Rooster’s iconic look. 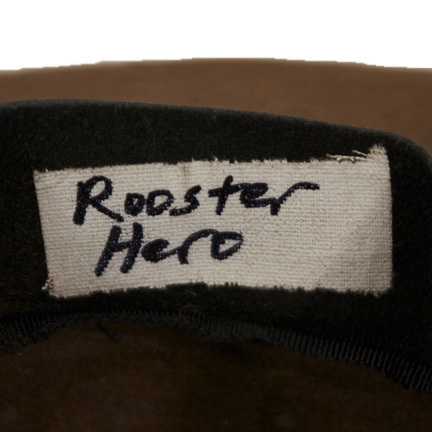 The interior band has a piece of tape with “Rooster, Hero” handwritten, identifying this as the character’s main hat worn throughout the film. 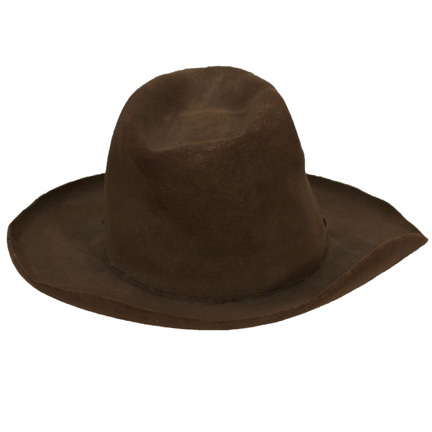 Mr. Bridges also appeared wearing this same hat in numerous promotional images for “True Grit”. 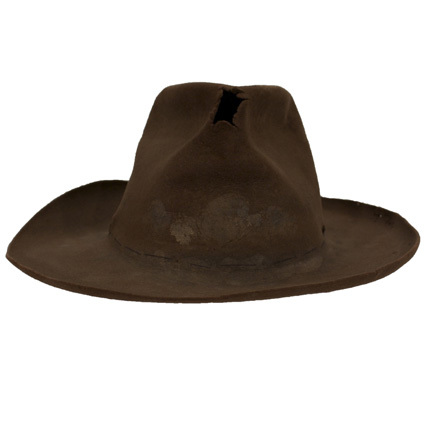 To help ensure that Mr. Bridges had the authentic look and feel of the original “True Grit”, the costumers rented a majority of the wardrobe including this cowboy hat from American Costume Company, who provided the wardrobe for the original film starring John Wayne. The owner, Luster Bayless, was John Wayne’s personal costumer and friend for the last 16 years of the actor’s life. 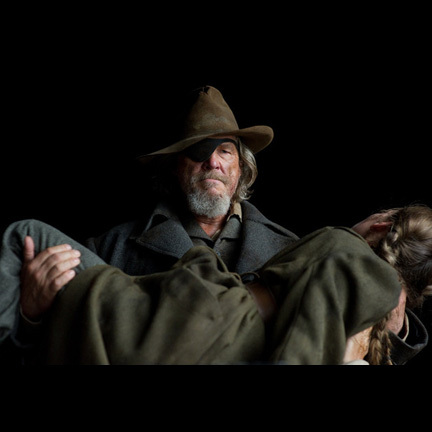 Mr. Bayless assisted Wayne in creating his iconic look for his role as “Rooster Cogburn” in his only Academy Award winning performance in “True Grit”, making him uniquely qualified to assist the Coen Brothers’ production in recreating the signature style of the original film with items such as this distinctive hat worn by Bridges. 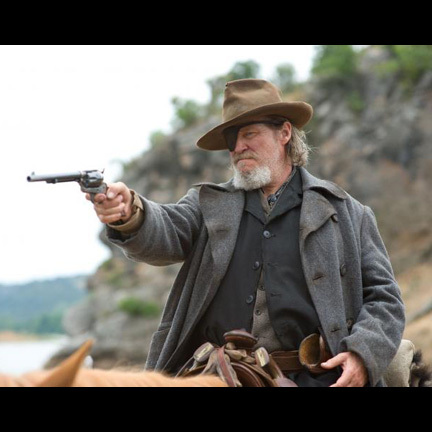 “True Grit” received ten Oscar nominations in 2011, including Best Motion Picture, Best Costume Design (Mary Zophres), and a Best Actor nomination to Jeff Bridges for his outstanding performance in the film. 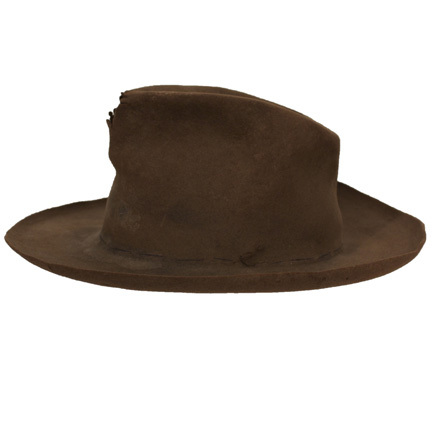 The hat was acquired directly from American Costume Company, who retained the item after the production of “True Grit” was completed. Accompanied by a signed letter of authenticity from Mr. Bayless.